Cruise around the desert trails of Nevada’s Valley of Fire aboard an ATV! On this thrilling tour, explore this desert valley, famous for its beautiful rock formations and red sand. Your professional guide will lead you along the best trails and point out interesting sights. Round-trip Las Vegas hotel transportation and lunch are included. After being picked up from your Las Vegas hotel in an air-conditioned mini-coach, get ready for an exciting ATV adventure in the Valley of Fire. As an added bonus, park fees are included in the price of your tour. 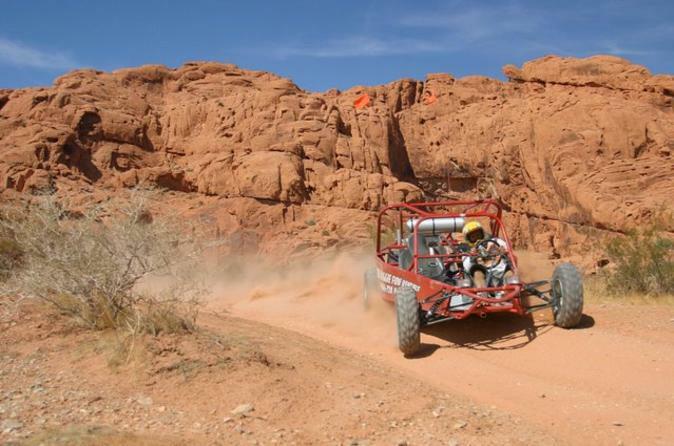 The Valley of Fire offers fantastic trails for both novice and expert ATV drivers. After a thorough safety briefing (all safety equipment, including a helmet, is provided), hop on your easy-to-handle ATV and take off into the desert wilderness! Enjoy approximately two hours of ATV action before replenishing with your picnic-style lunch (included). The Valley of Fire is world-renowned for its beautiful rock formations and red sand (it really is red, not bright brown!). You may also encounter big horn sheep or other native wildlife, and Star Trek fans may recognize many settings from the early TV shows. Your total tour duration includes hotel pickup and drop-off. Your total ride time is approximately 3.5-4 hours.